Luna moths are beautiful, large and striking North American members of the saturniids, or silk worm moths. 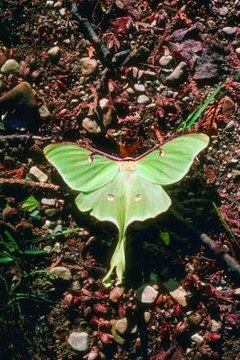 Luna moths are light green with lightly furred bodies, brown or yellow markings and feathery antennae, and can have up to a 5-inch wingspan. They have a characteristic "tail" emerging from their hind wings. The luna moth caterpillar is light green and lightly bristled with lateral yellow stripes. Differences between male and female moths primarily are behavioral. Like many moths, luna moths have feathery-looking antennae. These "feathers" actually are highly sophisticated sense organs that pick up chemical messages from other members of the species. Males have thicker, heavier antennae feathers than females, probably because chemical messages are emitted by female luna moths to attract males. When female luna moths are ready to breed, they emit chemicals called pheromones. Pheromones are neurotransmitters, like hormones, but while hormones communicate between cells inside one individual's body, pheromones are external communication between different individuals of the same species. Once a male luna moth picks up these chemical messages deposited by a female, he'll stop at nothing and fight nearly any obstacle to reach her. The primary difference between male and female luna moths is attraction: females are the attractors, males are the attractees. Females do not pursue males. Lady moths signal their availability, then go about their business. They breed with the first male who finds them and then lose interest entirely. Males' entire purpose in life, on the other hand, is to reach females, and they're not easily dissuaded once they find one. Male and female behavioral differences continue after breeding. Males continue to seek out willing females until they die. Females, on the other hand, lose all interest in breeding once they have done so, and spend the following nights seeking out nest sites and laying eggs. They deposit their eggs in small clumps on the broadleaf deciduous trees their caterpillars feed on, then pass away themselves.